The following is a history of the homes that stand or once stood north of where Compass Bank stands today, on the east side of Main Street in Vineyard Haven, Mass. After the 1883 Fire, as seen from the Methodist Church tower. (North is left.) From the 1954 Renear's Garage Calendar, courtesy Bob Renear. Probably taken from the top of the (new) harness factory, between 1883 and 1899. The Lambert House is at the center, with the Thomas Manter house behind it. Similar view. The Lambert and Manter houses are on the left, next to the factory chimney. Sarah (Manter) Dias (1762 - 1822) - See "The Dias House" below. Rebecca (Manter) Downs (1774 - 1849) - See "Mrs. Eleanora Luce's House" below. Thomas Manter (1777 - 1821) - See "The Thomas Manter House" below. Parnell (Manter) Newcomb (1779 - 1841) - See "The Lambert House" below. 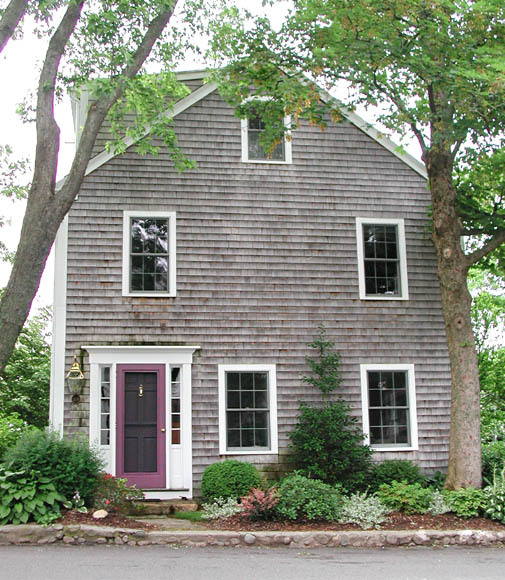 For more information about the Manters and the early history of these properties, consult James Norton's book "Walking in Vineyard Haven." This house stands just north of Compass Bank. "The house owned by Mrs. Oliver is the third of the first seven houses built, the two already mentioned being those of R. W. Crocker and H. H. Bodfish. It was built by Jonathan Manter more than two hundred years ago. He was a large landowner and leading man. He had a large family of children and gave each one a house lot. His daughter, Rebecca, being single at his death, was given the old homestead. She was exceedingly plain looking, I am informed, having four lips; but Deacon William Downs, a widower, was attracted perhaps not by her face but by her fortune and won Rebecca for a wife. Here he kept a grocery store. "Mrs. Love Chase was the next owner. It was afterward sold to my father and after the fire of 1883, was sold by my mother to Captain Oliver. There have been additions and improvements to this house; the writer has an affection for this old place where her girlhood days were passed. "Occupied by Mr. Robert Hyde; owned by Mrs. Lisette Knight. 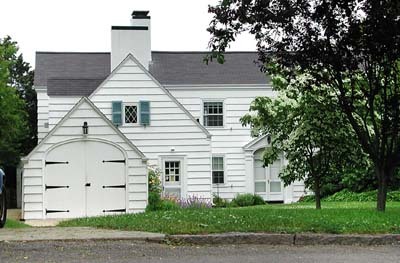 Homestead of Jonathan Manter, built in 1712. Jonathan Manter died in 1820, leaving the house to his spinster daughter, Rebecca. She married Deacon William Downs. They kept a grocery store there." Stan Lair said: "The Captain St. Croix Oliver house, and I believe it's now owned by the Lambert Knight family." According to Jim Norton, this house was built by Jonathan and Sarah Manter in 1756, with its front door on the south wall, facing the lane. After the death of widow Sarah Manter in 1831, this property passed to her daughter Rebecca Manter (1774 - 1849) and her husband, William Downs (c.1769-1843). 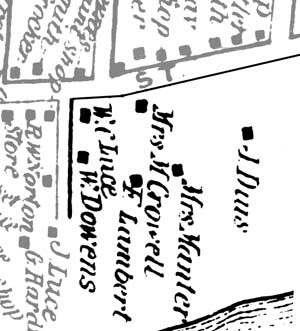 Downs may have been a native of Hyannis, perhaps the son of Jabez and Amy Downs. In 1793 he married his first wife Love Chase (1774-1819), daughter of Joseph Chase and Martha Hillman. In 1803 he signed the petition to establish the Baptist Society in Holmes Hole, and was later known as "Deacon" William Downs. He was on the "Committee of Safty" for Tisbury during the War of 1812. In 1820, the year following Love's death "very suddenly of the Cholera morbus," he married Rebecca Manter. He then opened a grocery store on his new wife's homestead on Main Street. He may also have been the Capt. William Downs who (according to Charles Banks) owned the tavern known as the "Berkshire House" (later called the "County House," kept by James Shaw West). 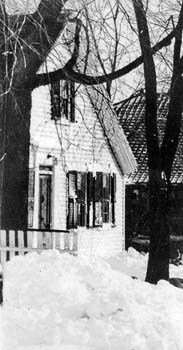 William Downs and Rebecca Manter had no children, but William did have a number of children by his first wife, many of whom grew up in this house: Jabez Downs (c. 1797-8 - 1821) who died at sea; Capt. William C. Downs 2d (c.1798-1865) who later occupied the lot in the rear (see below); Capt. Charles Downs (1800-1876) ; Henry Downs (c.1802-3 - 1832) who died at sea; Amy N. Downs (1805 - 1855) who married shoemaker Thomas Robinson; Capt. Constant C. Downs (1807 - 1891); Love C. Downs (1809 - ?) 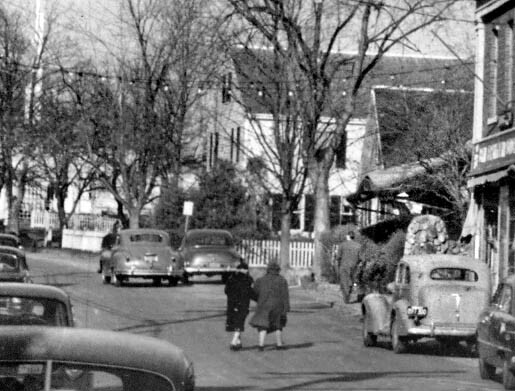 who later occupied the front lot (see below); Capt. George M. Downs (c. 1810-20 - 1847); and mariner and harness-maker Baxter Downs (1811 - 1887). Although the Downs' home was and is quite close to Main Street, Downs' grocery store was probably eventually moved to a new building behind the house some 60 or 80 feet from the road toward the harbor, accessible by the little lane on the south edge of the property (where a driveway still exists today.) In February 1840, probably upon Deacon Downs' retirement, his son Capt. William C. Downs sold this rear lot. I have documented the history of this lot separately - see "Betsey Downs' House" below. 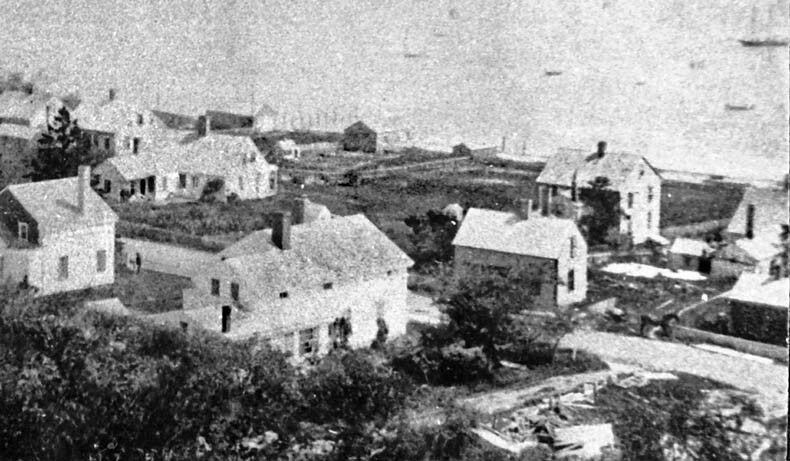 In March 1851 the far east end of the lot, on the harbor shore, was sold by Downs' heirs to shipmaster Charles D. Harding for $155. The front part of the property, including the Downs' home, was sold by their heirs for $450 the same month to elderly mariner, yeoman and gentleman (and real estate broker?) Tristram Luce (1778 - 1852). Two weeks later Tristram sold the property for $500 to Love C. (Downs) Chase (1809-? ), although he retained ownership of a barn which he moved off the property in the following weeks. Mrs. Chase was the younger of William Downs' two daughters, and the widow of Abraham Chase (1807-1850). Chase, a mariner, had died in 1850 of "Chagres fever," contracted while returning home on a steamer from the California gold fields. 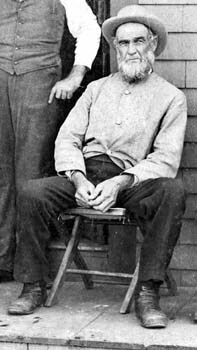 In April 1856 Love married Amos Curtis, a farmer of Freeport, Maine, and that June she sold her family home to trader William Cook(e) Luce (1812-1863). Love subsequently moved off-island, presumably to join her new husband in Freeport. The 1858 Walling map shows this house marked as "W. C. Luce." Luce was born in Tisbury, the son of Deputy Sheriff Jonathan Luce Jr. and his wife Sarah Holmes Dunham. He became a grocer and wharfinger about 1840, and was called a "merchant" and "trader" during the next two decades. 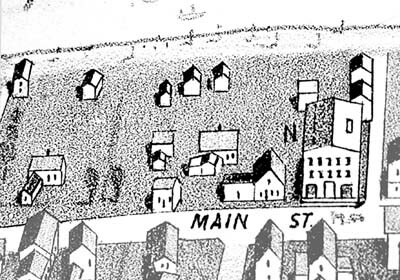 He is listed in the 1858 Walling Map Business Directory for Holmes Hole as owning a "Dry Goods & Groceries" business on the "Union Street Wharf" which actually referred to Union Street, just around the corner from his new home, next door to his father Jonathan Luce's house. Among the items he had for sale in 1863 were candy and flour. William Cook Luce was murdered the night before Christmas Eve, 1863, in his store, at the age of fifty-one. He was found "lying on his back in a pool of blood, a hatchet buried in his head" by his twelve-year-old daughter, who had come down to the store to see why he was late returning home. He had apparently been attacked while he was closing for the day, by means of an axe he had in his shop. A small amount of money was stolen. 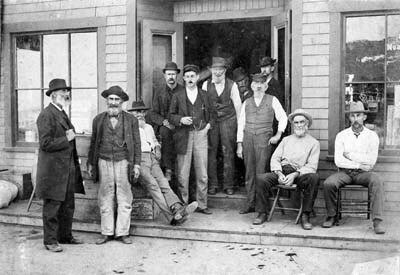 At first a group of intoxicated sailors from the schooner S. K. Hart were suspected, but then Gustavus D. Smith was arrested and tried for the murder. Smith was later acquitted, and the 1863 "Holmes Hole Murder" case remains a mystery. "For Sale. The store formerly occupied by Mr. William C. Luce. For particulars inquire of Mrs. Elenora D. Luce, Administratrix, or to David Smith, Holmes Hole." By 1870 she was living in Edgartown, living with her oldest daughter Mattie's family, but by 1880 had returned to this house, where she lived with her son. In reporting the events of the Great Fire of 1883, the New Bedford Evening Standard wrote "Several buildings seem to have escaped miraculously. The house of Mrs. William C. Luce, on the east side of Main street next north of the fire, had F. H. Jenkins's paint shop on the south and Mrs. Mary C. Dunham's house on the west, within 40 or 50 feet, both of which were burned." One retrospective writer added in 1920: "Mrs. Elnora D. Luce occupied a house which was at the extreme northern end of the line of fire. It's escape was miraculous, for it was near the hottest of the fire which raged in the harness shop, located where the Martha's Vineyard National Bank now stands and the paint shop next door. This house, the sole survivor for some two blocks down Main street, still stands, its trip white charms indicative of the beauty of the winding old street which was largely lost in the rush to rebuild." Mrs. Luce sold the house in 1884, and bought a home with her son and daughter on Woodlawn Avenue. She died at the age of 99. She was the mother of four children, Charles Granville Luce (1842-1847) who died at the age of four of scarlet fever; Martha Daggett "Mattie" Luce (1845-1818), a charter member of the local D.A.R. who married Sheriff Howes Norris; Sophia Jane Daggett "Jennie" Luce (1851-1925), who married Russell Munroe and died on the same day as her mother; and William Holmes "Willie" Luce (1855-1938) who worked at the harness factory next door as a young man, and later had a long career as a house painter. July 1884 - a partial view of the south side of this home, newly purchased by Oliver when this photo was taken. The Lambert house is visible on the right. The group at the far right are workers at Crocker's Harness Factory next door. In January 1884 this property was bought by Mrs. Sarah Jane (Johnson) Oliver ( - 1888) for $1000. The following September she bought the rear (shorefront) piece of the original tract, for $400, from John F. and Abby H. Robinson, together with the middle piece containing the old Downs storebuilding, for an additional $400, reuniting the three original Downs' properties which had been subdivided in 1856. Mrs. Oliver, originally from New Jersey, was the wife of Capt. Edward St. Croix Oliver (1833 - 1914). Capt. Oliver was born in Boston, ran away from home as a youth, and went to sea at the age of seventeen. He sailed as master of ships Harry Bluff, Cashmere, and Garnet. The couple had settled on the island in 1882, and Capt. 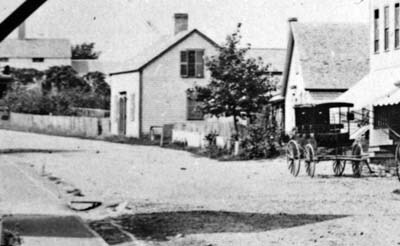 Oliver opened a ship chandlery and grocery store on Union Street, near the wharf (and by 1899 near the terminus of the electric car track to Oak Bluffs.) His second wife's obituary noted that "during his lifetime on shore the Captain was a prominent business man, and his ship chandlery was the corner store next to the Bethel. He followed the sea, as captain, for thirty years." After the 1883 fire, Oliver's store was the only place of business remaining in the town. Mrs. Oliver died in 1884, and in 1889 Capt. Oliver married Helen Augusta Oliver (1847 - 1922) of Boston. Capt. Oliver was listed as under "boats, ship chandler and grocer" in the 1897 Vineyard Haven directory, and "ship chandler and grocer" in 1907, the year he retired from business. He sold his business to Fred C. Vincent, and in 1908 the store was bought by Bodfish and Call (see Site #35.) In his retirement he wintered in Bermuda and Lakewood (Florida?). On the beach end of his property, he had a set of bath houses. Stan Lair said about them: "These were strictly bath houses, nothing else. I could rent a bath house for the season, or whatever." St. Croix Oliver at his store near the Bethel. RL: Down the road, there was a man where the trolley cars stopped, that end. RL: See him now. Sold cigars, cigarettes. Provisions. Little salty, there was some solicity there. Sailors used to come in and buy, same as Dr. Lane, you know? SL: He was on the corner of Water Street and Union Street. 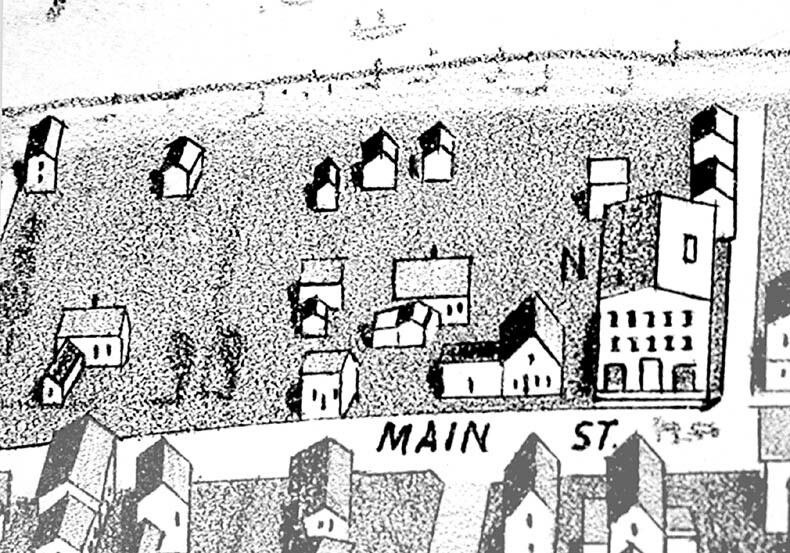 "[On the] corner of Water and Union Street [was the] Captain St. Croix Oliver Store. On the roof, in large letters, was painted 'SAIL LOT.' Now I don't know what they did in the sail lot. I presume they manufactured sails. Probably laid them out and sewed them, and all that. Anyway, it said 'SAIL LOT' on the top of this building. The trolley line from Oak Bluffs ended here too, right on this corner." Faded snapshot taken from the roof of Dean Luce's store (Site #30) about 1904-5, just before the construction of the bank. Capt. Oliver died in 1914. By 1922 Helen had moved to Dorchester, where she died. Her obituary in the Gazette noted that "Mrs. Oliver was the founder in this vicinity of the selling of Red Cross stamps, and when unable to get about to continue this merciful work, sold by mail and was director." A 1932 plan notes the owner of this property as Sarah Oliver of Lynn, Mass, presumably a relative of the Captain or his second wife. 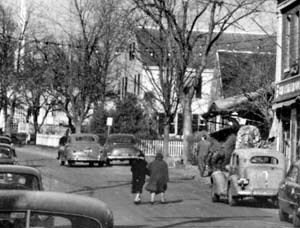 In February 1935 Grace W. Oliver, an unmarried Boston woman, sold this double lot to William B. Oliver of Lynn. (This deed explained that Grace had held a half-interest in the land and her sister Emma F. Oliver of Suffolk County, Mass. held the other half, until Emma's death at which time her interest was inherited by Grace.) In February 1939 William B. Oliver filed a petition in land court for title to this double property, and in June 1940 the court closed the case in his favor. By 1984 the property was owned by the family of Frank H. Knight, and by 1996 the house was owned by Joanne C. Horgan. This house stood directly behind Eleanor Luce's house on the little lane on the south side of her property, and was destroyed in the 1883 fire. No photos of it have been found. The lot has remained empty ever since the fire. "Just east of house of Mrs. Eleanora D. Luce. Was composed of quite a number of buildings, united in a dwelling by James Cottle. These were formerly the store of Capt. William Cottle, formerly a post office, store of William Downs Sr., generally known as Deacon Downs. It is said that "deacon" was a title without a function. There was also a storehouse of Capt. Richard Luce, and a building of Charles Dillingham used as a grocery. "Captain William Downs was first occupant, some fifty years ago. John Perry, carpenter, occupied prior to moving to California. Captain Downs was also a "forty-niner." It is related that while in a mining camp, where it was necessary to post a guard on account of Indians, it fell to Captain Downs to do his share of patrol duty, but he was tired and sleepy and no Indians had disturbed them lately. So he presently crawled into a tent and was soon in the land of oblivion. "In this tent a was a lighted candle stuck in the neck of a bottle containing some powder. The candle burned down and lighted wick dropped into powder, which naturally exploded. The noise set the captain to yelling "Injuns, Injuns," and the whole camp was aroused, but there were no Indians within fifty miles and the joke was on the captain." This was probably the site of Deacon William Downs' grocery store until 1840. Holmes and Luce point out that the house was a conglomeration of a number of store buildings, including the Capt. William Cottle's former post office building, which had been in operation on Main Street from 1828 to 1830 (see Site #___) as well as the (probably short-lived) grocery of Charles Dillingham (1821 - 1863) who married William C. Downs' daughter Rebecca in 1850. In February 1840, Capt. William C. Downs (c.1798-1865) and his wife Sophronia sold this small lot, including a "dwelling house," for $700 to Tisbury carpenter John W. Howland. The lot was about 48 feet deep by 88 feet wide, some 55 feet distant from Main Street. Two months later Howland sold the lot for $650 to Tisbury carpenters John Perry and Hervey Robinson (1795 - 1879). A May 1840 deed makes reference to the "Perry and Robinson Co." located here, suggesting that they may have had a commercial carpentry shop here, but Holmes and Luce note that Mr. Perry lived here as well. Carpenter John B. Perry (1811 - ?) and his wife Elizabeth lived in town with their three children in the 1840s and early 1850s. Perry was born in Sandwich, and had moved to Holmes Hole with his family from Falmouth between 1837 and 1843. The family evidently moved to California shortly after 1851. Betsey (Davis) Downs was born in Industry (or possibly New Vineyard), Maine. 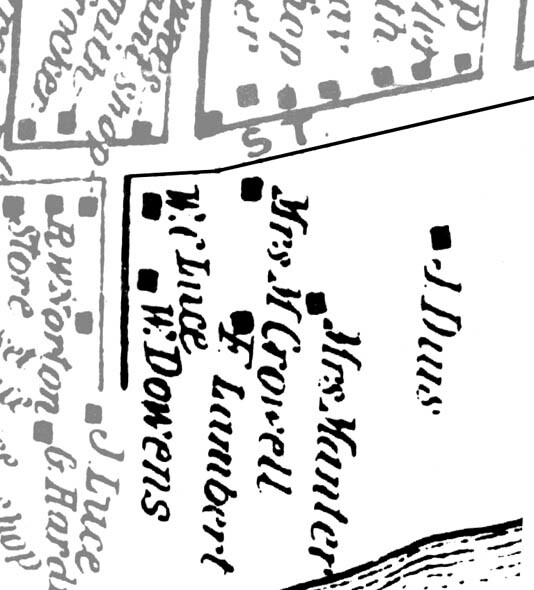 In 1850, just before her marriage to Downs, she had been living in this neighborhood with her parents James Davis (1873 - 1855), a farmer originally from Edgartown, and his wife Betsey Look (1872 - 1851). Capt. William Downs is known to have sailed on the ship Milwood of New Bedford from 1822 until 1823, and on the ship London Packet of Fairhaven from 1832 until 1835. He was described as a mariner in 1845 and 1853, a master mariner in 1860, and in the 1865 Tisbury census as a fisherman. The Milwood's crew list describes Downs as being 5' 5" tall with a light complexion and brown hair. William and Betsy Downs had no children, but he did have children by his first wife Sophronia, probably as follows: Jabez Downs (1824-1825) and William H. Downs (1826-1828) who both died young; Rebecca W. Downs (1829 - 1863) who married mariner and painter Charles Dillingham; seaman William C. Downs Jr . (c. 1835-9 - ?) who left the island in the late 1860s; Charles Downs (1836 - ?) who presumably died young; seaman Charles G. Downs (1839 - ?) who evidently left the island; and Francis N. "Frank" Downs (c.1845 - ?) who joined the Army during the Civil War and evidently never returned to the island. Capt. Downs died in September 1865 in Tisbury of Typhus fever. Betsey lived alone in this house for a number of years afterwards, but in the 1880 Tisbury census she appears as a 73-year-old widow again sharing her home with James Davis and his wife Emeline B. Davis (____-1883). The 1883 fire burned down this house, and was widely attributed to causing Emeline Davis' death, the only human casualty of the fire. The New Bedford Evening Standard wrote of his financial loss: "James Davis, dwelling and shop. Loss $800; no insurance." The New York Times also noted that "The wife of James Davis, an aged citizen, died from excitement consequent upon the fire." James Davis, now a homeless elderly widower, moved to Starks Maine, where we can only guess he had relatives willing to take him in. In July 1884 Betsey Downs and James Davis sold the burned property "including the buildings, brick and stones remaining thereon" to John F. Robinson of Tisbury, and two months later Robinson sold it for $400 to Sarah Jane Oliver, who by this time had purchased the front and rear tracts. This portion of the property has remained empty since the fire. Betsy Downs died in 1900 in Cottage City at the age of 88. 1884 - 1899. The Second Crocker Harness Factory is visible on the far right. This is the second house north of the bank. It was radically renovated in the early 1900s. Stan Lair said: "Next one was the William M. Randall house, now owned by Lambert Knight, and directly back of this house was the house belonging to Mrs. Lambert, who was Lambert Knight's grandmother." "The house above Captain Newcombs, on Main Street was built for his mother and after her death, became the property of Captain Nathan Smith, who exchanged it for the house now owned and occupied by Postmaster S. C. Luce. "Owned and occupied by Mrs. Lisette Knight and family. This house-lot, which like most others at that time, reached from the harbor to Tashmoo Pond, was Jonathan Manter's wedding gift to his youngest daughter. She was named Parnell, for her oldest sister who was one of the Liberty Pole girls, and who died in 1777. The second Parnell married Alexander Newcomb in 1801. They built their house on the lower end of the property facing the harbor." According to James Norton, this house was originally built by Sally Newcomb, on land given to her by her son Capt. Alexander Newcomb (See The Lambert House, below.) Following her death from heart disease in 1836, her widowed daughter-in-law and her grandchildren sold this lot for $200 to Nathan Smith. The house stood on the extreme northeast corner of the lot, and a fence filled the rest of its north border. 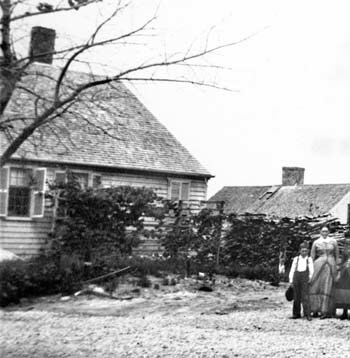 In August 1841, farmer and yeoman Nathan Smith (1784 - 1857) and his wife Polly J. Dunham (c.1788-9 - 1849) sold this small 35-foot-wide lot, together with their dwelling house, to Mary Crowell. 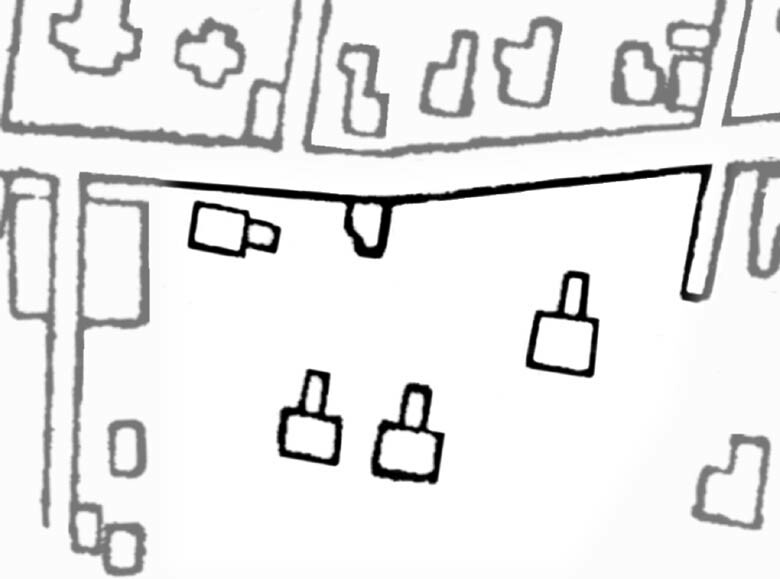 The house was stood right on Main Street, and was only 17' long on its east-west dimension. Mrs. Mary C. (Lambert) Crowell (1807 - 1882) was the widow of Capt. William Crowell (1800 - 1840), who died at sea in March 1840, leaving her with a 17-month-old son, Barzillai Crowell (1838-1898). Mary was the daughter of Samuel Lambert and Mary Chase. In 1861 Barzilla joined the Army to fight the Confederacy, and served almost four years as a private in the J Company of the 20th Mass. Infantry. He was injured in battle, and his right leg was amputated at the knee. He returned to his mother's home and lived here until his death, living off his pension and family savings. Mary died in 1882, and Barzilla in 1898. A week after great fire of 1883, Wendell Crocker temporarily kept his store in Barzilla Crowell's home, the "second house north of the ruins." In 1900 The Crowell's house was sold to Capt. William M. Randall (1853-1914) for $900. Capt. Randall was the son of Sylvester and Sarah Ann Randall of Port Jefferson, Long Island, NY, and the husband of (1st) Louise Harding Dillingham (1855-1906) and (2nd) Lou D. McDonnell. Quite wealthy, it was undoubtedly Capt. Randall who heavily renovated this house in the early 1900s, even turning the gable end toward the road. Randall's obituary states that he was "for half his lifetime one of the best known masters of our seacoast and then a prominent investor in real estate and other kinds of property. Capt. Randall commanded the respect of all who knew him for sound sense and excellent business judgment by which he acquired a competency. Capt. Randall was born at Fort Jefferson, L. I., of seafaring stock and became master of a vessel at the early age of 17 years. He married for his first wife Louise Harding Dillingham of this town and she was his constant companion on his voyages until the  loss of his beautiful and finely furnished floating home, the four-masted schooner Louise H. Randall, in a terrific gale and blinding snowstorm off Long Island and their narrow escape from death, shocked her nerves so that she persuaded her husband to give up the merchant service. A very graphic story of this thrilling experience and escape from drowning was penned by Mrs. Randall and printed in a neat pamphlet. [See The Fate of the Schooner Louise H. Randall: A Story of the Sea by Louise H. Randall (Boston, 1903) for her account of this experience. The booklet, which includes photos of the couple, can be found at the Martha's Vineyard Historical Society.] The Captain then became owner of the water boat Susie D. and purveyor to the needs of all the craft passing through Vineyard sound and touching here. From this business he retired some years ago certainly 'well-to-do.' Capt. Randall was a Master Mason and Son of the Am. Revolution." He was also well-known as the captain of the Susie D., which ran mail up and down the coast for many years. In 1896 Mrs. Randall was a charter member of Vineyard Haven branch of the D.A.R., the Sea Coast Defense Chapter, and she served as its Regent during 1904 - 1906. She died suddenly while in this capacity, on a stop in Brooklyn following her attendance at the Continental Congress in Washington, D. C.
Following Louise's death, Capt. Randall retired. In 1908 the newspaper reported the sale of steamer Susie D.: "The Susie D. is one of the best known vessels on the coast. Capt. William M. Randall, the master and managing owner, is retiring from active business...." It goes on to note that this vessel ran mail for many years. Capt. Randall married again in 1912, to Lou D. McDonnell, and the Gazette reported that "Capt. Randall is one of the best known Master mariners on the American coast, and Mrs. Randall comes from an old and well-known family of Ohio. They both spend their winters in the sunny south, and it was there that they met." Randall died in 1914, and his estate included numerous properties: the "Dillingham House," the "Legge House," the "Tashmoo House," the "Beaton Place house," the "Crowell Place house" [undoubtedly the one he lived in, at this site], the "Vincent Place house," the "Hanfsen(?) Place house," a building on Main St., land at Port Jefferson, NY, and a half interest in the "Roland Luce Farm" in West Tisbury. In 1923 Capt. Randall's widow Lou, by now living in Martins Ferry, Ohio, sold this property to widow Emma Lizette Lambert (c. 1858-9 - ?) of Brooklyn, NY. After the death of Mrs. Lambert, this property was inherited by her daughter, Mrs. Lisette S. Knight, who lived next door (see "The Lambert House," below.) Mrs. Knight bequeathed the property in turn to her son Lambert Knight, and from him it passed to his son Frank Knight. In 1995 this house was bought by Carroll L. Buress. This house stands behind the Crowell family house, on an lot shaped like a backwards "L" which stretches to the harbor. 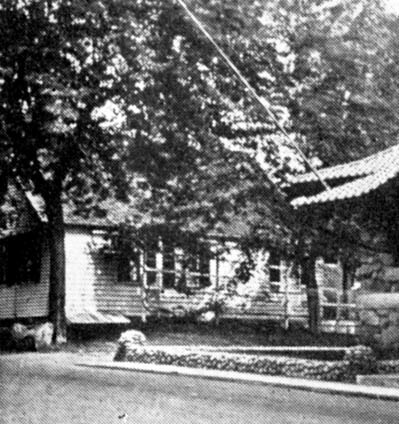 A driveway to reach it traditionally stood between the Crowell house and the Luce house. "In [this] house lived [Thomas Manter's] sister Parnel, daughter of Jonathan Manter and sister of Parnel, the Revolutionary heroine, born after her death and named for her. This Parnel married Captain Alexander Newcomb; they had several children and Caroline married Captain Frederick Lambert, who resided there and it still belongs to that family. "The last Jonathan Manter, who died about 1842, was a man of strong will and from his eccentricities of character he seemed to have made strong impressions on the minds of all who knew him. Even the names of his dogs and horses are well remembered. More than one hundred years ago there were but two horses owned around the harbor. Their names were Romeo and Cape Breton, and Captain Manter owned Romeo. The first cooking stove used in this place or on the Island was purchased by Captain Manter and brought over in the vessel he owned and commanded, called the Harmony. "Captain Manter owned most of the land from the harbor to Tashmoo and the old Manter house which was destroyed in the fire of 1883, was one of the old landmarks of the village and especially so of Manter Hill, -- it being the first one erected on the hill. It was near this house the famous liberty pole stood when destroyed by the three girls in 1775." "Owned and occupied by Mrs. Lisette Knight and family. The Newcombs built this house soon after their marriage for Mr. Newcomb's mother. After her death the house changed hands several times." This house was said to be built in 1803 by Parnel (Manter) Newcomb (1779 - 1841) and her husband Alexander Newcomb (1780 -1832). It was one of several subdivision lots of the 18th-century Manter tract that covered this hill. Parnell was the youngest daughter of Jonathan Manter and Sarah Chase, and Alexander was evidently an illegitimate son of Sarah Newcomb of Tisbury. In September 1843, following their widowed mother's death, the Newcomb children (Phebe Ann, Almira, Alexander, Angeline, and Sophronia Newcomb) sold this property and the house to their sister Caroline Newcomb (1814 - ?) and her husband Frederick M. Lambert for $800. Capt. Frederick M. Lambert (1805 - 1877) had married Caroline in 1833. He was a master mariner from Chilmark. They lived in this house for nearly two decades before moving to Brooklyn, NY. However, they maintained ownership of the house, and it was rented out to a series of families, not all of whom have been identified. The 1865 census suggests that one family who leased this house during the Civil War period was Mrs. Betsey R. Cannon of Mattapoisett with her three adult children. Capt. Lambert died in Brooklyn in August 1877, and by 1900 the property had evidently been inherited by William Sprague Lambert (1852 - ? ), the youngest son of Capt. and Mrs. Lambert. He was listed in Brooklyn as a shipping clerk in 1880. Lisette Sneden (Lambert) Knight (c. 1880 - 1974) moved here with her mother and son from Brooklyn, NY by the early 1920s, into this, her ancestral home. She was the widow of physician Dr. Frank H. Knight of Brooklyn, NY, and the mother of Capt. Henry Lambert Knight (c.1903-4 - 1981), known to most people as "Lambert". Lambert went on to become a well-known Vineyard yachtsman. His son, Frank H. Knight, owned the property until the 1990s. In 1995 this house was sold to Alfred H. Williams of Edwards, Colorado. Stan Lair said: "Okay, back on Main Street again, next house beyond the Randall house was Loretta Daggett. The Harris M. Crist house was at this location. I don't recall whether it was a remodeled Loretta Daggett house, or a new one, but the Harris M. Crist house was here. He was the editor of the Brooklyn Eagle, and now it is occupied by the Dr. Strocks." "The house now occupied by Miss Loretta Daggett was built by Captain Thomas Manter, her grandfather. He was the son of Jonathan Manter, a Revolutionary soldier, and married Hannah Luce. "In 1820 while on the pilot boat Superior, she capsized, and Thomas Manter was drowned. The property has always remained in the family. The age is not known but the deed of the land was made in 1802 and it is natural to suppose that the house was built soon after." James Norton states that the original house at this site was built in 1802 by Thomas Manter (1777 - 1821). Thomas was a son of Jonathan Manter and Sarah Chase, and inherited a slice of his parents' land on Manter Hill. He drowned in 1821. His widow, Mrs. Hannah (Luce) Manter (1777 - 1858) was the daughter of Matthew and Ruth Luce, and the mother of several children, including Matilda, Henry, and Serena Manter. Sisters Serena and Matilda Manter lived together in their mother's home for many years. Serena (Manter) Daggett (1808 - 1894) was the wife of mariner Capt. Franklin Daggett (c.1802 - 1854). Her younger sister Matilda Manter (1820 - 1891), at age of 42, married 84-year-old boatbuilder Presbury Norton in 1861. The marriage lasted three days before Norton died of bronchitis. She was left to raise her new stepson, Frank P. Norton, who eventually opened a clothing store in town - see Site #28. By 1865, the two widowed sisters were living together with their children and working as laundresses. It's not clear whether they remained on this property long after 1860, although they maintained ownership of it, and Serena's daughter Loretta lived here by the turn of the 20th century. By 1860, Ariel and Amanda Luce and their family were evidently living here and sharing the property with Serena (Manter) Daggett and Matilda Manter, although its unclear whether the property was subdivided in some way, or whether there was more than one building on the premises. 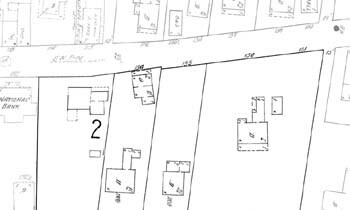 By 1873, however, the streetside portion of the property, at least, was marked on the assessors' map as belonging to Ariel Luce. Mariner and laborer Ariel R. Luce (1799 - 1873) and his wife Amanda F. Look (1815 - 1880) were the parents of several children, including Fanny Woodbury (Luce) Smith (1839 - ) who was the mother of SBS partners Art and Bert Smith. "Before my Grandfather (Walter Hurtine Renear) built the house (former "Bead Shop") on Church Street, he lived in the Harris M. Crist house. My Aunts, Mildred and Frances Renear, were born there. My father told me that it was torn down; that must have been sometime before 1933 or I think I would have remembered it." See Site #2 for more on Sheriff Walter Renear. Miss Loretta Lambert Daggett (1852 - 1931) was born in Holmes Hole, the daughter of Capt. Franklin Daggett and his wife Serena Manter. According to her obituary, Loretta lived her whole life in this house, "the old Daggett home," noting "She had been a seamstress and also a clerk in one of the town stores for many years previous to her illness." About 1911, Daggett had a paralyzing stroke, and she was left an invalid for the last twenty years of her life. By 1920 she was being assisted by live-in housekeeper Elizabeth M. DeHuff. The property was passed to her cousin, shoemaker and printer Ellis H. Manter (1856 - 1933), who lived directly across the street. (See Site #37.) Ellis was the son of seaman Capt. Henry H. Manter (1816 - 1879) who held the deed to the property. In May 1935 Addie Slack Crist of Brooklyn, NY bought this property for $7500 from the estate of Ellis H. Manter. The following month, she bought six additional feet from Mrs. Bodfish, her neighbor on the north. The old Manter house was demolished or removed, and a new estate was built. Addie's husband Harris M. Crist (c.1874-5 - 1946) was a nationally-known newspaper man. In 1935 he sold his interest in the Brooklyn Eagle and he and his wife made their permanent home here, in a new house they built that year, slightly closer to the road. Mr. Crist was born in Sparta, Ill., the son of Philip A. Crist and Mary A. Fowler. He spent his youth in Washington, D.C. and was hired by the Washington office of the Brooklyn Eagle, eventually moving to the home office in 1910. He served as news editor, managing editor, treasurer, and in 1932, vice-president and part-owner, before retiring from the Eagle in 1935. They were known for their lavish Christmas parties at their house each year, open to the Vineyard Haven public. Stan Lair said: "Capt. Hartson H. Bodfish house. He was a famous whaling captain, and a book was written by Joseph Chase Allen about Capt. Bodfish, titled "Chasing the Bowhead." He had two boys, Howes and Hallett. 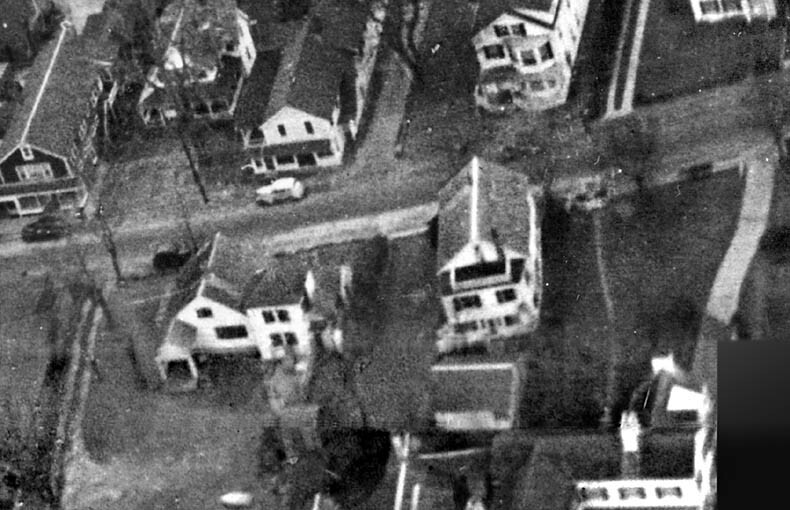 And eventually the house was demolished by a woman who brought her own home from Oak Bluffs - moved it over here - and later it was owned by the Hanrihans. Mr. Hanrihan was the owner of the Mohawk Carpet Factory." "The house known to many as the Dias place on Main Street, now owned by Captain Hartson H. Bodfish, was one of the first built in the village and is consequently quite old. 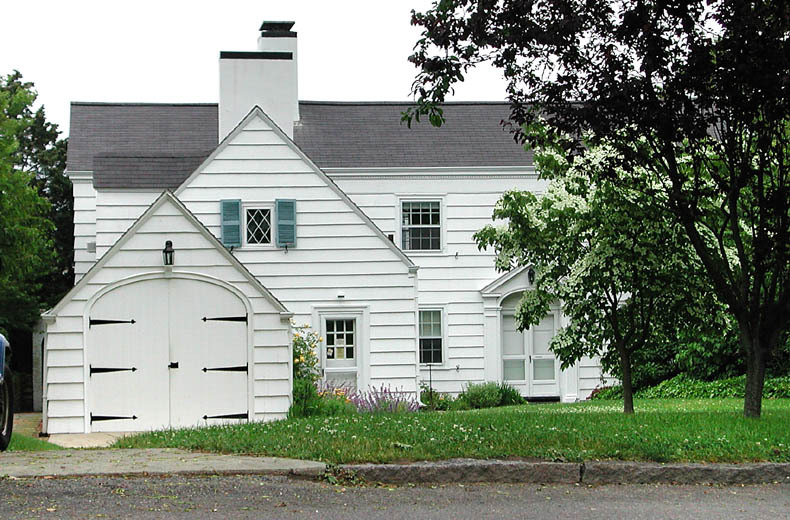 In a deed in possession of the family, dated May 20th, 1741, this house was deeded to Abraham Chase by Sarah Daggett. The place is spoken of a 'ye house lot,' and the house lot's limits were Holmes Hole harbor on the east and Tashmoo on the west, -- and the inference drawn is that the house was built by the Daggetts between the years 1725 and 1741. "On March 29th, 1741, Abraham Chase deeded the house to John Whelden, a sea-faring man and the sum paid for the house and lot in both deeds was said to be 330 pounds current money. Abigail, wife of John Whelden, was the daughter of Abraham Chase. "In 1795 the property passed into the hands of Thomas Whelden, doubtless his son. The next owner was Captain Joseph Dias, who fought in the war of 1812, and it has since remained in the family, -- Mrs. Bodfish being a granddaughter." According to James Norton, "the Dias Place [was] a house built by Samuel and Sarah Chase Daggett soon after their marriage in 1733, and maintained by them as an inn until his untimely death in 1740." Jonathan Manter's third eldest child was Sarah Manter (1762 - 1822), who married Portuguese immigrant Joseph Dias of the Western Isles. Their son Joseph Dias (Jr.) (c.1782 - 1859) lived at this site. James Norton states that he built his house here about 1815, on the site of Samuel Daggett's 1735 house. Dias married Eliza "Betsey" Holmes (1789 - 1864), who was the daughter of John Holmes and Elizabeth Norton. They had several children including John H. Dias (1816 - 1876) who never married, and Mary E. Dias (1830 - 1911) who married Capt. Willis Howes (1825-1904). Joseph was a mariner and pilot, and his son John, a laborer and fisherman. After the Joseph's death, Mary returned to the household with her husband Willis Howes and their two children. 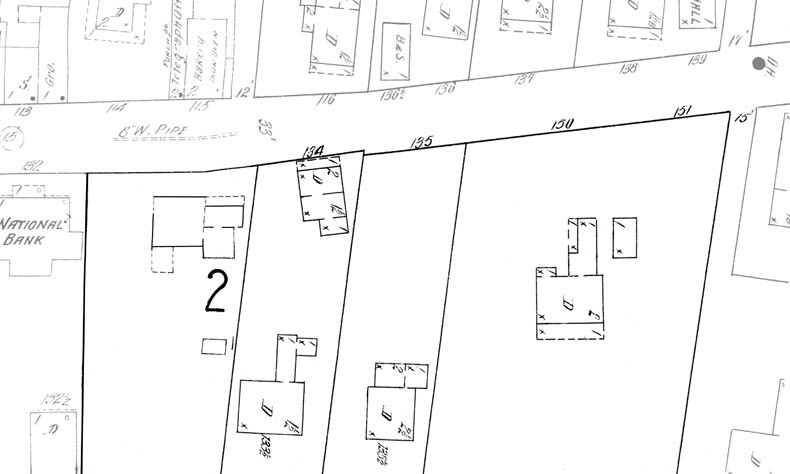 The 1873 Assessors map notes this property as "John Dias." John Dias committed suicide in July 1876, and the house was left to his sister. In February 1877 the surviving children of Joseph and Betsey Dias formally sold this land and house to Mary and her husband for $1350. Capt. Howes at Capt. Oliver's store. Capt. Howes was the son of Lot Howes and Deborah Baker. He was a master mariner and a Navy veteran from the Civil War. His rank was Ensign and he served as Acting Master of the Dictator and the Vanderbilt between 1864 and 1866. Their daughter Clara D. Howes (1862 - 1937) married Hartson Hallett Bodfish (1862-1945) in 1893, the son of grocer William P. Bodfish and Polly Crowell (see Sites #34 and 35), and upon their marriage he joined the household. Upon Capt. Howes' death, Clara inherited the property. Capt. Hartson H. Bodfish, among the very last of the island's whaling captains, spent over thirty years in the Arctic Ocean, catching whales, tending to injured sailors as an untrained but successful surgeon, and studying the Inuit people of Alaska. His life story was told in the book "Chasing the Bowhead," co-written with Joseph Chase Allen. He also had an Eskimo family in the north, and his Inuit son Kusiq has also had his own story written, in his own book "Kusiq." In June 1935 Clara sold a six foot strip of the south part of her land to her new neighbor Addie Crist (see "The Thomas Manter House," above.) 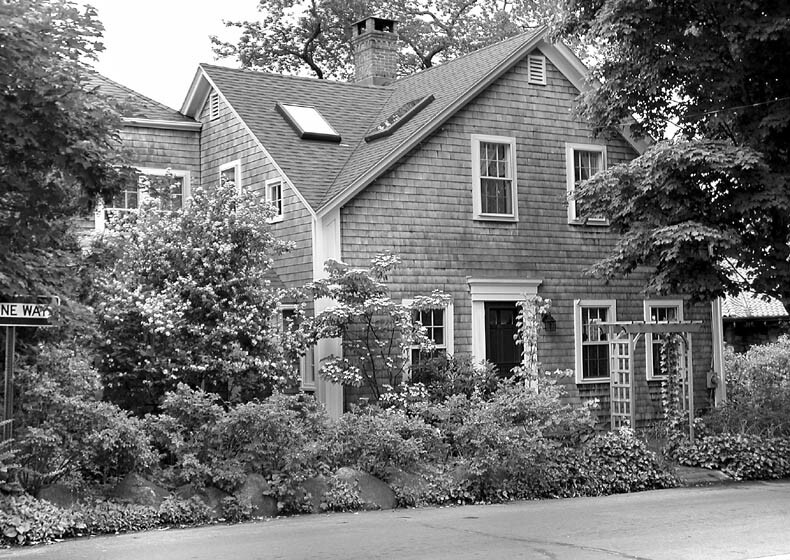 In October 1936 Clara's brother, Willis H. Howes, formally sold his interest in the property to his sister, and the following month she sold the property to Miss Bessie E. Shearer of Boston. 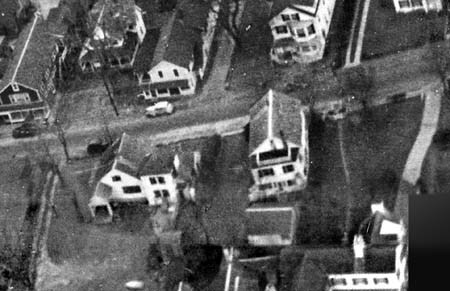 Stan Lair said that Miss Shearer demolished the old Dias house and moved her own here from Oak Bluffs. "Capt. Hartson H. Bodfish house. 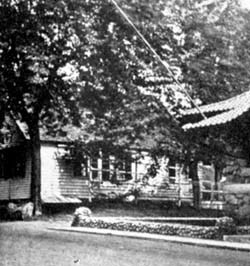 Norton says that Hartson's house was torn down in 1936. I think it was 1937. 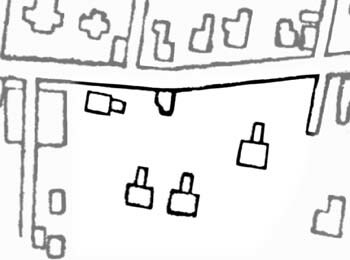 Hartson's wife (Clara D. Howes) died 7 Jan 1937 and it was sometime after that uncle Harty moved to William Street (a small house on the north side, two or three houses east of Look Street)." In February 1951 Miss Shearer sold the property to Bertha Grimes Hanrihan (1896-1983) of Westwood. Bessie's husband John J. Hanrihan (1895-1974) of Westwood, Mass., appears in the 1929 Newton directory as employed by the Albany Carpet Cleaning Company in Newton, Mass. The Hanrihans evidently only summered here, and continued to live in Westwood off-season. In 1973 the Hanrihans sold the property to Jeanne H. Connolly of Hingham and Westwood for "$1.00 paid and love and affection." By 1988 this property was owned by Edmund J. and Jeanne H. Connolly of Needham, Mass.